As a little girl, I chose Matthew 10:29-31 as my favourite verse because it comforted me to know that I am worth so much to God and that he has a plan for my life. As the years went by, I got to a stage in my life where that verse was just words in a book. I didn’t really believe them anymore and God knew it. One morning, bright and early, I was woken up abruptly by a loud knock knock-knocking on my window. This alarmed me, as you can imagine, as my room is upstairs. What on earth was knocking on my window? I got up, opened the curtain and … nothing. I reasoned with myself and put it down as my imagination or a branch from the nearby tree, swaying in the wind. Then, later that afternoon, I was sitting on my bed and again, knock knock knock on my window! I slowly turned my head, only to see the most beautiful sparrow sitting on my window sill knocking against my window, peering into my room. My explanation? The bird had fallen in love with his own reflection. My little sparrow friend returned over and over again, knocking on my window almost every day. I was delighted that he had chosen my window out of all the windows in the house, I felt special. 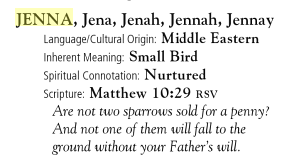 Months later, as I was researching the meaning of my name, I found a great book that defined the meaning of Jenna as small bird - like the small sparrow that keeps knocking on my window (I hadn’t quite realised that just yet). It gets better; the book also gives a scripture verse for each name. Take a wild guess which verse was next to my name? Matthew 10:29. God sent this beautiful sparrow to my window to remind me that I’m worth more than many sparrows and he is always caring for me and my future is planned. I burst into tears and felt surrounded by a blanket of warm, fuzzy love. You won’t believe it but that sparrow knocks on my window to this day. And every time he does, I just smile because I realise that I am special enough for God to send this beautiful creature to my window over and over again - just to remind me of his love. Perhaps God isn’t necessarily sending you a sparrow but he is pursuing you in countless other ways. You just have to open your eyes and your heart to see it. He loves you endlessly and tirelessly, just as he loves me. 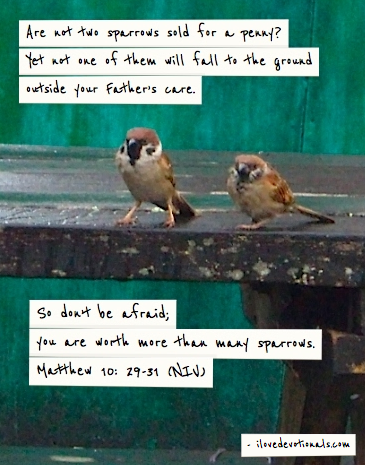 Do you believe you are more valuable than a sparrow to God? Ask that today God will show you how he is fighting for you endlessly and tirelessly. Don't forget you can subscribe to I LOVE DEVOTIONALS or follow on Twitter and Facebook. Are You Only Living 30% Of Your Life? Is It Okay To Show Weakness?